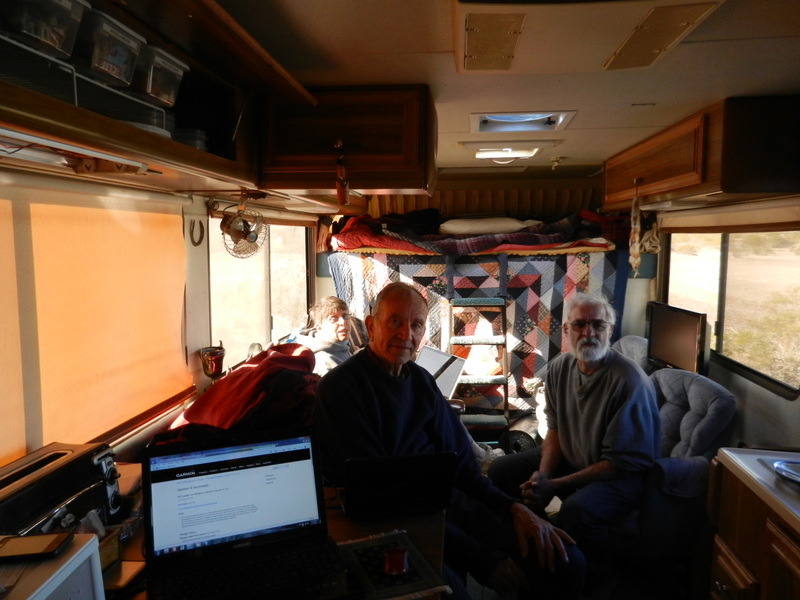 A couple of days ago Ed, Jerry, Beverly and myself all got together in my rig so that Ed could show us how to add POIs (Points of Interest) to our Garmin GPS. We were all able to connect to my 3G/4G Hotspot to get on the Internet. Ed went through all the steps explaining everything at each step. Once we had everything set up it was quite easy. I was able to add Wal-Mart, Reststops, and Pilot Gas stations to my Garmin. Then he showed us how to access it on our Garmins. How cool!!! Thanks Ed for being so patient with us. Here is a pic of all of us (except me) working on this project. 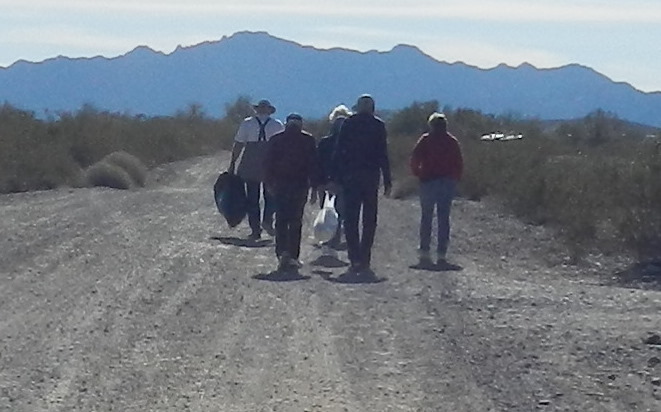 Later on everyone made a mass hike to the dumpster about 1/4 mile down the road. 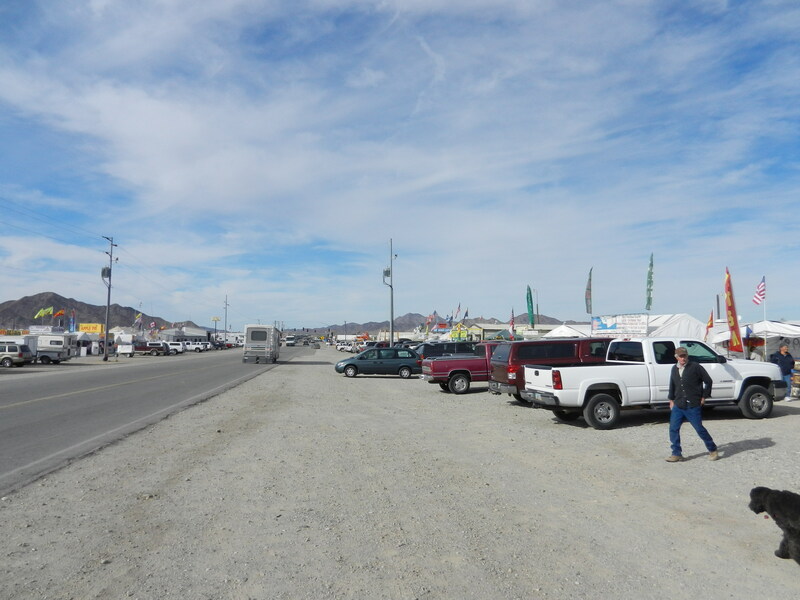 We also did a bit of shopping on Kuehn St. Lots of vendors. I bought an Indian Taco at Ed’s advice and was it ever good. Shredded beef on Indian fry bread. Very good! I wish I had taken a pic of it. 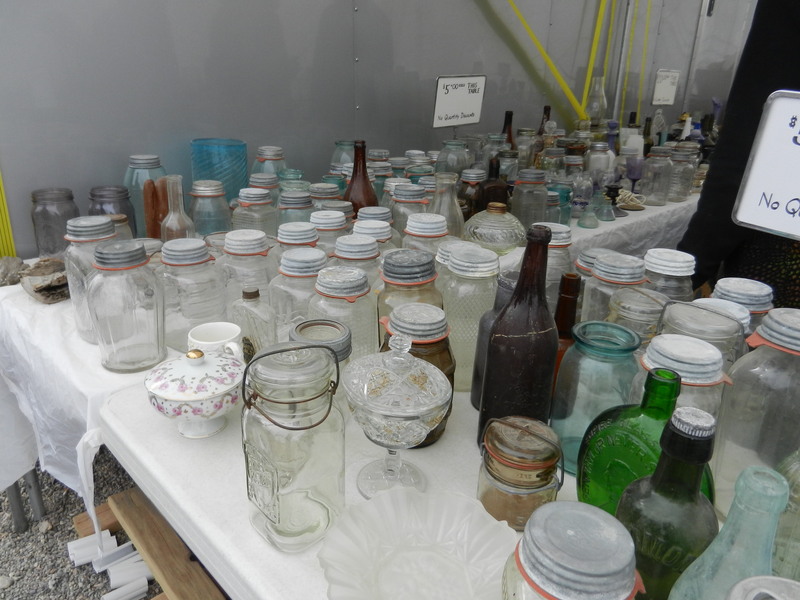 Then we also did some shopping in the Tyson Wells Flea Market. I ran into a neat collection of old bottles. 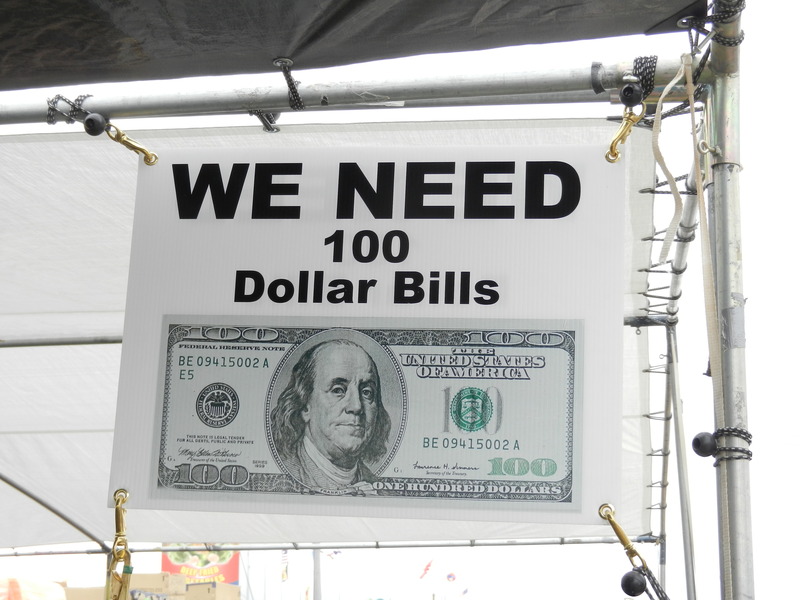 One of the vendors had this sign up. I guess we are all in the same boat. I would like a few of them myself. Before we left I picked up my license plate holders. That night we had our pinata party. Chuck and Beverly had been at Algadones, Mexico and purchased a pinata and also some tamales. Everyone furnished something for dinner and happy hour that had a Mexican theme. Here is a pic of our pinata. After dinner we all tried to break the pinata. We all had a great time and Linda finally broke it and candy was everywhere. I put together this small movie of everyone trying to break the pinata. We all had a great time. 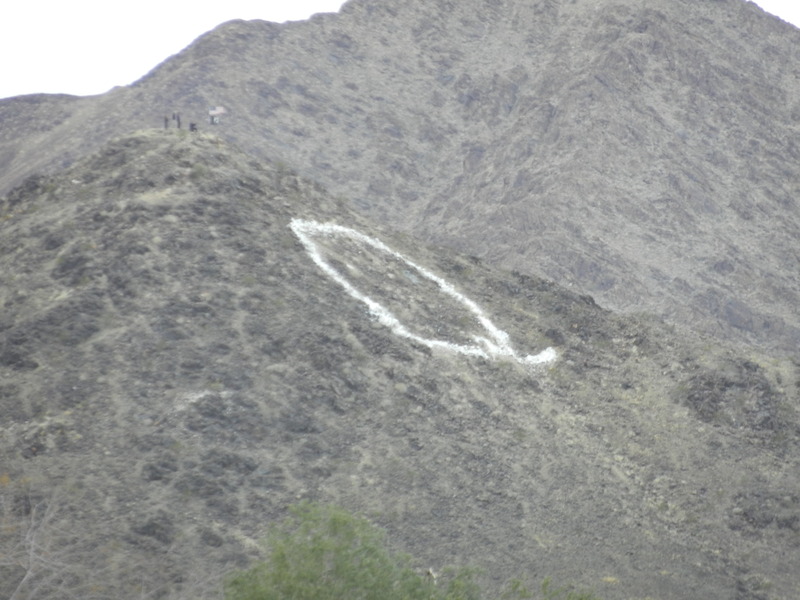 I took this pic of the Big Q on the side of the hill. 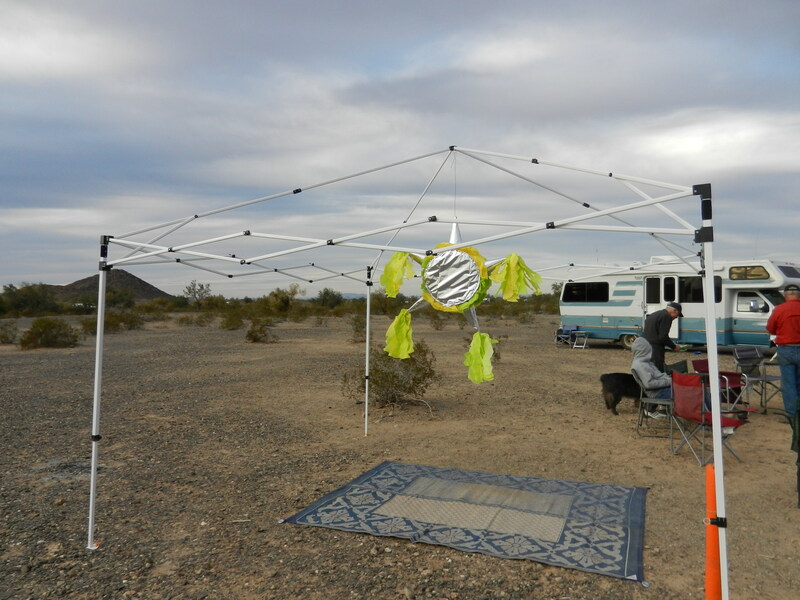 This entry was posted in Arizona, BLM Land, Boondocking, Hiking, La Posa BLM, Lazy Daze RVs, Pinata Party, Quartzsite, Quartzsite Lazy Daze Rally by Jim Melvin. Bookmark the permalink. Just goes to show that the grown-ups can enjoy a pinata too! Hope you didn’t get sand in the candy lol!! 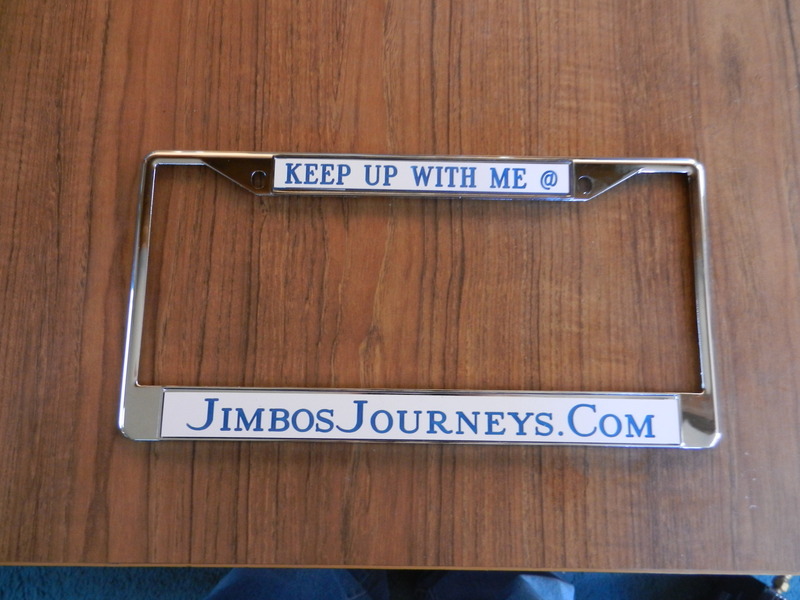 Like your license plate holder. Waaaah!!! I always miss the good stuff!! Don’t worry, there will be lots more fun coming up. HAHAHA! That Pinata Party looked like fun! Thanx for sharing. Did you forget to mention the amount of tequila consumed? That might indicate why it took so long to break the Pinata! 🙂 Enjoy your retirement, as I see you are. No Tequila! Just Corona’s for me.